The ridiculously inclement weather on Saturday nightdidn’t deter the local fans turning out in force at the stylish Beach Ballroom in Aberdeen to show their support for local hero,former two division World Champion Lee ‘The Aberdeen Assassin” McAllister, as he sought to secure the World Boxing Foundation (WBF) Welterweight World Crown on just his fourth outing since returning to the fray in November last year, following a close to four year sabbatical from the sport due to injury. 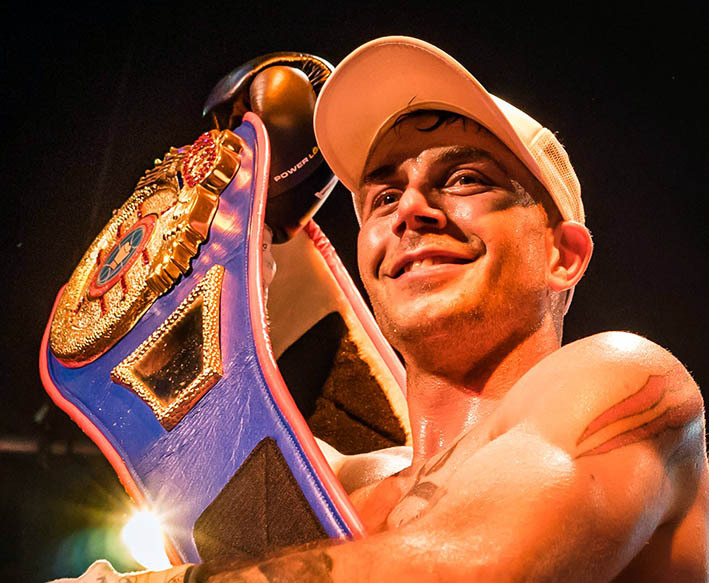 McAllister, who won the World Boxing Foundation Intercontinental title back in February to add to the many accolades that fill his overflowing trophy cabinet, such as British Masters, BBBofC Scottish Area, WBF International as well as Commonwealth and WBU World Crowns at both Lightweight and Super Lightweight, he had secured in the first part of his career. On Saturday evening McAllister faced former WBC Youth World title challenger, the big hitting Ghanaian Frank Dodzi, who had nineteen wins on his record, seventeen of whom he beat in knockout fashion, including a victory over WBA Pan-African Champion DodziKemeh, the only loss sustained by Kemeh to date. The atmosphere inside the Beach Ballroom was electric as MC Douglas McAdam announced the impending headline bout. The Scottish fans in full party mood gave Dodzi a noisy and genuinely warm reception as he made his way to the ring, however just minutes later when their main man’s impending entrance was announced the decibel levels went through the roof. Right from the off the Ghanaian went on the attack and clearly intent on yet another knockout victory to add to his record as he let rip with big looping right hands. McAllister is as ring savvy as they come and with exquisite movement glided out to avoid the looming haymakers before gliding back in to let rip with a big left to the body followed by silky smooth combinations to body and head. The second round started at a more realistic pace and took the form of a tactical chess match from both sides, Dodzi utilizing his height and reach advantage in an effort to keep the highly mobile McAllister at a comfortable range as he sought the opening to let rip with another powerful exocet style attack, McAllister on the other hand danced his way around picking his punches and landing them at will. As the round progressed McAllister began targeting the body of the Ghanaian with great effect, so much so that in the second half of the round the Scot was able to land a pin point accurate shot to the solar plexus, forcing Dodzi to take a knee in order t get his breath back. The crowd went ballistic, each believing that victory was in sight for their man, but no, on the restart Dodzi regrouped and took a more defensive approach, enough to see him make it safely to the end of the round. Round three started in similar vein to the second, however the canny Scot had clearly sussed out his opponents weakness and started to work on opening the Ghanaian’s excellent defenses, before letting rip with a massive left to send Dodzi crumbling to the deck. McAllister ran straight to the corner to celebrate in front of the partisan crowd, however his celebrations were cut short as Dodzi somehow found the strength to begin rising to his feet. McAllister halted his premature celebrations and prepared to resume battle, but just as he did Dodzi dropped to his knees and clearly in distress signaled he was unable to continue at which pont referee Lee Murtagh waived the bout off on the one minute and seven second mark. Immediately the crowd jumped to their feet once more as McAllister resumed his victory celebrations once more. 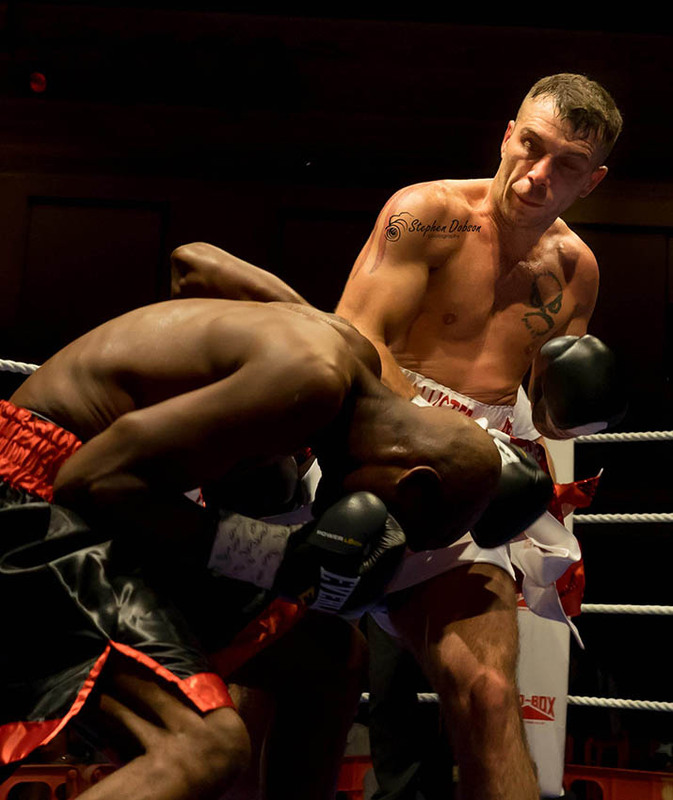 Preceding the McAllister-Dodzi World title fight was a British Masters Cruiserweight Championship rematch, featuring current Champion Manchester’s James Higgy against old foe Nairn’s Sandy Robb. Higgy secured the Masters Crown, over Robb, back in April with a good solid 98-94 points victory, many observers were expecting the same result after the Mancunian dominated the first stanza in similar vein to their first encounter. The local fans kept urging their man on in the second but Robb seemed more than happy to just soak up the punishing shots peppering his frame and just let rip with a big right hand when an opportunity presented itself. Going into the third Robb forcefully maneuvered his way to the centre of the ring and began backing Higgy onto the ropes, before letting rip with powerful hooks and uppercuts at every opportunity. Robb utilized similar tactics in the fourth and continually walked his man back before letting rip with powerful close range shots to the head, then just as the round was heading to it’s conclusion Robb let rip with a massive shot to the body to send the Champ to the deck in spectacular fashion. 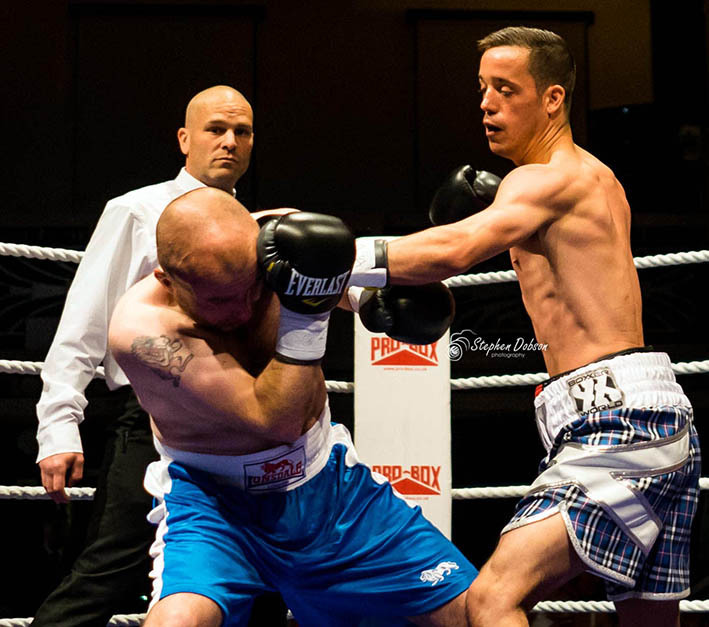 Initially there was much concern about Higgy’s condition, as he lay prostrate in the ring that Referee Lee Murtagh waived the fight off at the 2 minute and 35 second mark so that the medical team could assist the distressed fighter. Once recovered and seated in his corner, even though it was a body shot that ended the bout, the concerned officials decided that an immediate scan with a portable infra-scanner, that detects bleeds to the brain, must be undertaken in the ring, rather than the usual post fight in the changing room due to the number of big punches to the head Higgy had sustained in the preceding round. 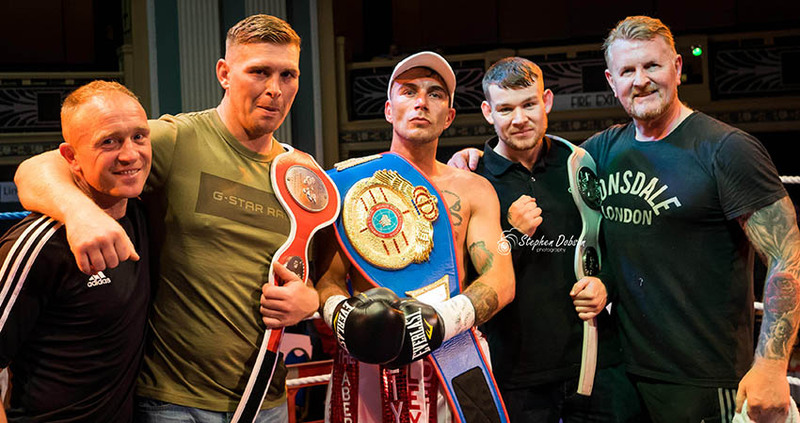 Prior to the Higgy-Robb Masters title fight was another Masters championship bout, this time between the Granite City’s very own Nathan Beattie and Riga, Latvia’s IgorsDubovs, for the International Masters Novice Crown. 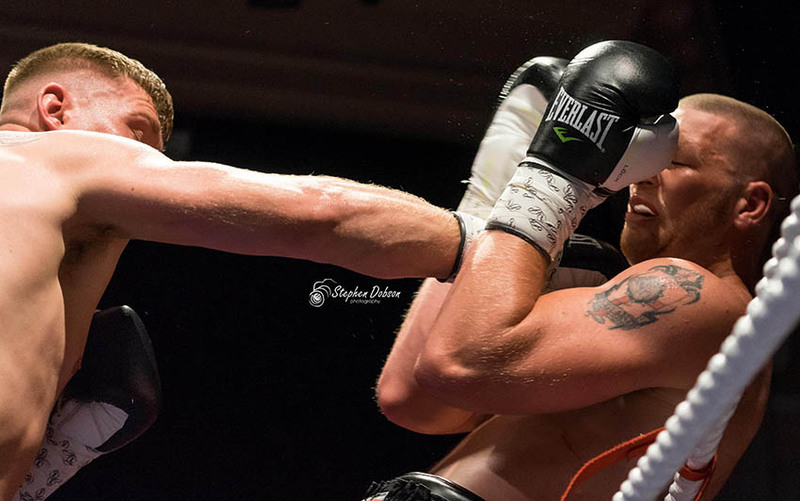 Dubovs started hard and fast taking the fight to Beattie, however the Scot kept his cool, utilizing his powerful jab to keep the hard charging Latvian from inflicting any major damage. For the first minute or so both men fought hard to secure centre ring, much to the delight of the partisan crowd, Beattie then began to exert his authority, landing a couple of cracking head shots that had the desired effect of forcing Dubovs to raise his guard, leaving an opportunity for Beattie to switch his attention to the body, which he took in magnificent style with a short sharp shot that sent the Latvian to the canvas gasping for breath. Dubovs tried so hard to beat the count but just couldn’t catch his breath enough to do so, leaving referee Sammy Hill no option but to waive the fight off on the one minute and fifty four second mark. 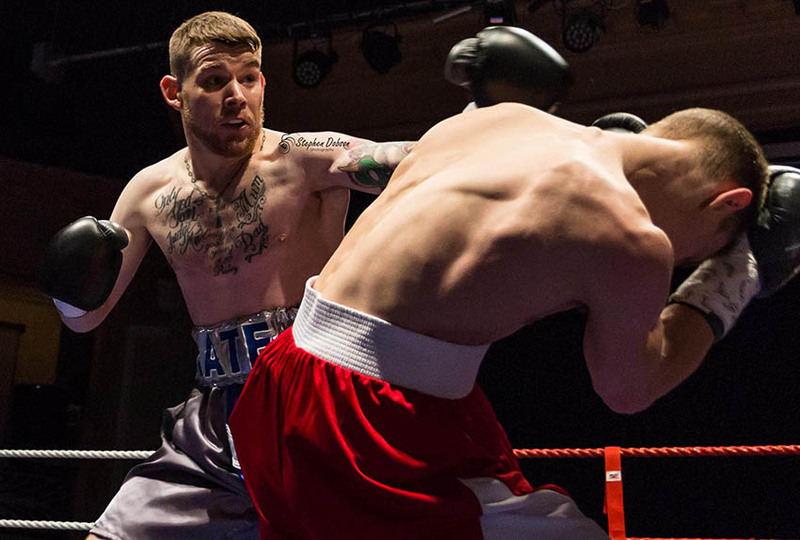 There was one further fight scheduled, between debuting Super Flyweight Andrew Cuthbert and Manchester’s Thomas Murry, however Murry had failed to make it to the venue due to transport problems. However, Belfast’s Marty Kayes, who was at the event as part of Lee McAllister’s corner team, stepped up to the plate and offered to fight the stellar former amateur, albeit in a contest deemed by the officials to be classified as an exhibition. It may have been classified as an ‘exhibition’, but clearly neither protagonist was interested in taking part in just a glorified sparring session, as believe me this fight was as competitive as they come, both men going for it full on. Cuthbert showcased his immense skills in front of his home crowd, don’t for one minute think it was all one-sided though, it wasn’t by a long shot, anyone that has seen Kayes in action will know what I mean, when he’s in the ring it’s to fight, end of, but the young Scot boxed exquisitely throughout the four rounds to rightfully have his hand held up as victor by Referee Edward Law, who scored the bout 40-36 points in his favour. All in all a fantastic event, great venue, great crowd and even though the main Championship bouts all ended early, each fight was all action and ultra competitive so the fans went home with their appetite for pugilistic action well and truly sated.